Michelle’s Place is thrilled to host an educational seminar – Nutrition and Cancer: New Research and Resources – Tuesday, January 9th from 6:30 – 8:00 pm at the Center in Temecula. Jerry Hizon, MD is a family medicine and primary care sports medicine physician in Murrieta will lead the seminar. Good nutrition is important for cancer patients. Eating the right kinds of foods before, during, and after cancer treatment can help the patient feel better and stay stronger. Nutrition therapy is used to help cancer patients keep a healthy body weight, maintain strength, keep body tissue healthy, and decrease side effects both during and after treatment. Recently, the ketogenic diet has received attention for its successes in reducing tumor size. This will be a major focus of linking nutrition and cancer. 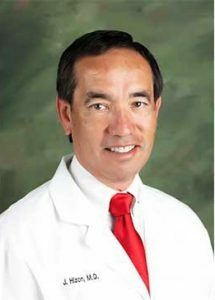 Jerry Hizon, MD, specializes in family practice and medical services for athletes, people who enjoy sports recreationally, and those interested in complementary medicine. In the past, he has worked as a sports physician for a number of professional football events including serving as the medical team physician for the San Diego Chargers. As a sports physician and nutrition coach, Dr. Hizon is proud to serve his community as well as his private practice patients. Over the past two years, he has transitioned to a ketogenic diet, and has researched the many benefits it can bring to cancer patients. A ketogenic diet can help to increase energy, alleviate stress level and achieve an overall decrease in physiological inflammation. Whether you’re looking to lose weight, manage a chronic medical condition, or simply want to overhaul your eating habits, changing your diet for the better is one of the best ways to improve your overall health. This seminar is open to the public. To RSVP visit michellesplace.org/seminar-rsvp or call (951) 699-5455. Michelle’s Place is a full-service breast cancer resource center providing free resources to women and families impacted by breast cancer in our community. The Center is located at 27645 Jefferson Avenue, Suite 117 in Temecula.